Built in the the late 1600's by William Osbaldeston, Lord of the Manor and MP for Scarborough in 1658 (died 1701) it was a square-fronted, three-storied large house in what became known as 'the Queen Anne style'. Mentioned in John Wesley's diaries c.1750, where he noted that the 'preached in Hunmanby staying in Mr Osbaldeston's large house'. William was followed by his son and heir Richard (Knighted by Charles 11) who married three times, followed by his eldest son William who died unmarried in 1766. Due to bereavement, his successor was his youngest brother Fountayne Wentworth Osbaldeston who was also unmarried and died in 1770. Lacking any male descendants the Hall (and Manor) now passed down to the eldest grandson (via his mother Theodosia, daughter of William Osbaldeston), one Humphrey Brook of Brayton, near Selby who took up residence and the name Brooke-Osbaldeston. It was Humphrey who enclosed the village in 1809, forming the Hunmanby agricultural estate. He then formed what is now Hunmanby Hall Park and Plantations, extending the large house by adding Southern and Northern wings. This enlarged property then became Hunmanby Hall with its own park. Humphrey died in 1835 after a period of 65 years at the Hall. He was an outstanding 'Lord' whose many good works left the Manor both financially and socially stable. Again lacking male heirs the estate/manor was entrusted to Bertram Mitford whose great grandmother was Mary, daughter of William Osbaldeston. He and His wife Frances inhabited the Hall for seven years until Bertram's death in 1842. He died without issue. Succeeded by his brother Robert Mitford,RN. Admiral of the Red, who was a fine, benevolent Lord of the Manor, highly regarded by his tenants. dying in 1870. He was the last true Lord of the Hunmanby Manor to reside in Hunmanby Hall. The Manor now passed down to Colonel J.P. Mitford and later still to Mr E.L. Osbaldeston. Neither of the latter resided at Hunmanby Hall but ran the estate via their Agent and living at Mitford Castle, County Durham. The Hall was let off to several tenants, most notable being Lord Cecil, comptoller to Princess Beatrice, who had married the eldest of Admiral Mitford's grand-daughters. The turn of the century found Sir Dennis Readett Bayley renting Hunmanby Hall. He was High Shreriff of Yorkshire and although his business was in the southern part of Yorkshire he took Hunmanby Hall as his 'seat'. After W.W.1 tHE Mitford family sold the Hunmanby estate to Sir Dennis, complete with the Lordship. Sir Dennis immediately sold off all land and properties to his tenants (making convenient financial arrangements for all) and departed from the Hall in 1922. It was then purchased by Lord Nunburnholme and he resided therin until the death of his youngest son in 1924 when the Hall was placed upon the market. 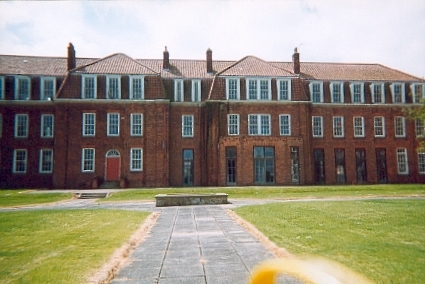 Empty of nearly three years, Hunmanby Hall and Park were then purchased by the Methodist Education Board and converted into Hunmanby Hall Girls Boarding School wihich opened in 1928 and for the next sixty-three years (excluding five years evacuation 'to the Dales' during W.W.2.) became one of England's leading girl's boarding school with pupils coming from the four corners of the world. 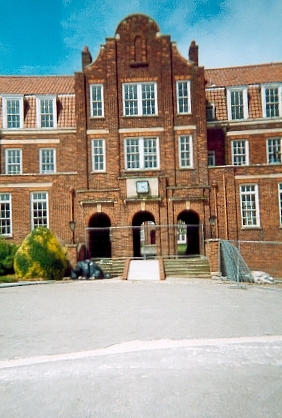 Sadly, with the downturn in private education, Hunmanby Hall finally closed its doors to its pupils in 1991 and today, 2005, after several years unoccupied, has been turned into luxury flats. The school sports-hall has become a private fitness centre and the beautiful park has its private nine-hole golf course.